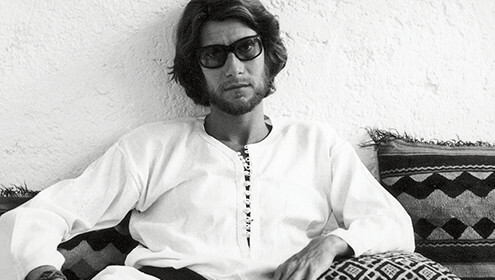 Yves Saint Laurent was born on 1st August 1936 in Oran, Algeria, where he spent his youth and adolescence. In 1955, after studying at the Chambre syndicale de la haute couture in Paris, Yves Saint Laurent was introduced by Michel de Brunhoff, then director of the French edition of Vogue, to Christian Dior, who immediately took him on as his assistant. When Dior died in 1957, Yves Saint Laurent became artistic director of the House of Dior. He presented his first collection, ‘Trapèze,’ in January 1958 to great acclaim. Called up to do his military service and hospitalised at the Val de Grâce, he was dismissed by the House of Dior in 1960. In association with Pierre Bergé, whom he had met in 1958, Yves Saint Laurent decided to create his own couture house. His first collection was presented on 29th January 1962 at 30 bis Rue Spontini in Paris. The Yves Saint Laurent fashion house remained there for 12 years, during which Yves Saint Laurent invented the modern woman’s wardrobe: the pea-jacket and trench coat in 1962, ‘le smoking’ in 1966, the safari jacket and the first pantsuit in 1967, the first garments using transparent fabrics and the first jumpsuit in 1968. By appropriating male dress codes, he offered women self-assurance, audacity and power while preserving their femininity. Wishing to dress all women, not only rich haute couture clients, Yves Saint Laurent opened his SAINT LAURENT rive gauche boutique in 1966 in Paris, the first ready-to-wear boutique to bear a couturier’s name, thus paving the way to what has today become the fashion world. Beginning at the end of the 1950s and throughout his career Yves Saint Laurent created costumes for the theatre, ballet and cinema. He worked with Roland Petit, Claude Régy, Jean-Louis Barrault, Luis Buñuel, François Truffaut…and dressed Jean Marais, Zizi Jeanmaire, Arletty, Jeanne Moreau, Isabelle Adjani and Catherine Deneuve, who became a close friend. As early as 1965, Yves Saint Laurent paid tribute to artists in his haute couture collections, for example with the famous Mondrian dresses, then in 1966 with the Pop Art dresses and in 1967 with his major homage to the Bambara art of Africa. In the 1970s he presented his Picasso and Diaghilev collections; the 1980s saw tributes to Matisse, Cocteau, Braque, Van Gogh, and Apollinaire. 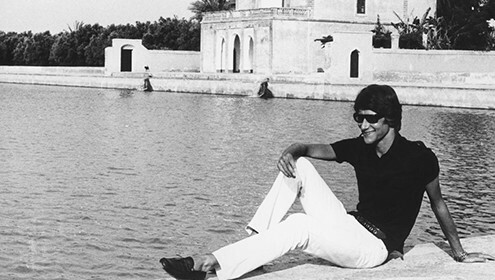 Yves Saint Laurent would travel to Marrakech for a fortnight in December and June of each year in order to design his haute couture collections. Morocco, a country he visited for the first time in 1966, was to have a major influence on his work – particularly his colours – as did his ‘imaginary travels’ to Japan, India, Russia, China and Spain. All provided sources of inspiration for his collections. In 1974, Yves Saint Laurent and Pierre Bergé moved the couture house to 5 Avenue Marceau in Paris, where Yves Saint Laurent would assert his style. In 1983, the Metropolitan Museum of Art in New York devoted a retrospective exhibition to the couturier. It was the first time that a living fashion designer had received such an accolade at the prestigious institution. Large-scale exhibitions were subsequently held in Beijing, Moscow, Tokyo and, of course, Paris, at the Musée des Arts de la mode in 1986. In 1998, Yves Saint Laurent organised a runway show with 300 models on the pitch of the Stade de France on the occasion of the World Cup. On 7th January 2002 he announced at a press conference that he was ending his career. On 22nd January of the same year, a retrospective show was held at the Centre Georges Pompidou, showcasing 40 years of Yves Saint Laurent’s creative work. Over 300 models were seen, including his last Spring-Summer 2002 collection. From then on Yves Saint Laurent devoted his energy to the activities of the Fondation Pierre Bergé – Yves Saint Laurent, which was state-approved as a nonprofit entity on 5th December 2002. Its mission is to conserve 5,000 haute couture garments and 15,000 accessories, sketches and other objects making up the collection; to organise thematic exhibitions on fashion, painting, photography, the decorative arts, etc., and to support cultural and educational initiatives. On 10th March 2004, the Foundation Pierre Bergé – Yves Saint Laurent opened its doors to the public with an exhibition entitled Yves Saint Laurent, Dialogue avec l’Art. More than twenty other exhibitions devoted to art, fashion and design were mounted at the foundation between 2004 and 2016. The foundation assures the conservation and prestige of Yves Saint Laurent’s work via publications and exhibitions held in France and throughout the world. In 2007, the French Republic awarded Yves Saint Laurent the grade of Grand Officier de la Légion d’honneur. 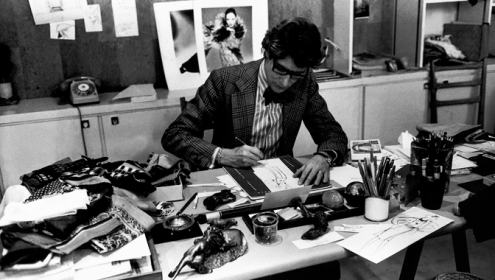 On 1st June 2008, Yves Saint Laurent passed away at his Paris home at the age of seventy-two.